Having received much acclaim and entered the Rs.100-crore club within the first week of its release, Dangal, the biopic on the life of the 2010 Commonwealth Games gold medalist wrestler Geeta Phogat and her family, has delighted the real life protagonist the most. During a star-fans meet held here at the DLF Promenade Mall in Vasant Kunj, thestatesman.com caught up with India’s first woman gold medalist wrestler, who was here in the capital city to unveil the new team of UP ke Dangal on Tuesday. “It feels good to see the success of the biopic. I am very happy. 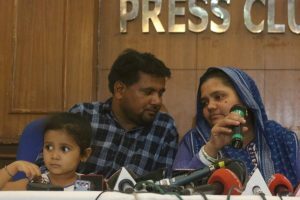 Now many people will get to know the struggles me and my family have faced to reach where we stand today,” Geeta said in an exclusive interview. The Phogat sisters, Geeta and Babita, met their fans at Promenade, clicked selfies with them and enjoyed giving autographs to the crowd that went gaga to see the real life champions. Dangal has been drafted on the backdrop of a male dominated society, where a former wrestler Mahavir Singh Phogat, who couldn’t win a medal on his own due to some hardships, vows his son would fulfill his dream. Mahavir’s wife gave birth to four daughters and thus he gave up his dream, thinking that girls can’t wrestle and should only be kept behind hidden doors. However, Mahavir’s two eldest daughters Geeta and Babita worked hard to fulfill their father’s dream and outdid the stereotypical image of a girl in the society. In the film, it was seen that Mahavir wasn’t much content with the way Geeta was trained in the National Camp in Patiala, ahead of the 2010 Commonwealth Games and decided to train her with his own techniques. “I was extremely happy at the National Camp in Patiala. I didn’t think much but kept training till the D-day and enjoyed every moment as it was shown in the movie as well,” she said. The 28-year-old Haryana eve counts the Commonwealth Games gold medal as one of the most cherished moments of her life and happy to see her story as an inspiration for all in the form of a movie. At the moment, Geeta is gearing up for the upcoming Pro Wrestling League season 2 that is scheduled to start on January 2, 2017. “My preparation is going well for the PWL 2017. Motivated by the moment, my main focus now is to do well for UP Ke Dangal to crown them champions in the second season,” the UP skipper added. The league will be a humdinger for wrestling fanatics across the globe as both national and international wrestlers will feature in the 17-day-long event. Rio Olympics bronze medalist wrestler Sakshi Malik will be another top best besides stellar Phogat sisters. “I will also face more fellow wrestlers as my opponents, but I take this as a healthy way and will fight like it’s meant to,” Geeta said when asked what if she plays Sakshi under the same category in the league.